298 pages | 12 B/W Illus. Especially coming out of the landmark presidential elections of 2008 and 2016, the study of the American presidency--both as a political institution and of those who have held the office--is one of the most fascinating and dynamic fields of study within American government. New Directions in the American Presidency takes a current look at the various issues facing the contemporary presidency and provides a "state of the art" overview of current trends in the field of presidency research. This volume of original chapters by leading presidential scholars is designed to include all the essential topics covered in an undergraduate-level presidency course or a graduate-level seminar while also bringing together key disciplinary debates and treatment of important current real-world developments. Each chapter is written with students in mind so that it remains accessible, interesting, and engaging. New key chapters on presidents and political parties and presidential leadership (essential following the 2016 presidential election). A fresh approach to the President and the Constitution, and the President and domestic policymaking, are provided by new authors for these foundational chapters. All chapters have been revised with updates coming out the 2016 election, especially in relation to presidential campaign politics, media, and the Supreme Court. In the second edition of New Directions in the American Presidency, Lori Cox Han and her colleagues address a range of key issues, challenges, and opportunities confronting presidents. The essays, firmly grounded in the evolution of the presidency and its interplay with the broader U.S. political system, combine the latest political science scholarship and contemporary illustrations with keen analytical insight and engaging narratives. Readers will welcome the volume’s balance, its probing examination, and its thought-provoking assessment. In this superlatively written and thoroughly updated second edition, Lori Cox Han has brought together some of the field's most insightful scholars to deliver an eminently analytical volume for any course on the U.S. presidency. Highly recommended. This new edition of New Directions in the American Presidency is timely and broad-ranging, featuring the latest analyses by leading scholars of the presidency. This collection succeeds in addressing major long-standing questions – and suggests directions for future work – in the field. Well-written and very balanced, this volume should be of equal interest to students of and experts on the presidency. Lori Cox Han’s new edition of New Directions in the American Presidency assesses executive branch politics comprehensively and highlights the most recent research in this area. In focusing on the presidency, the book covers the larger political landscape that chief executives interact with, including Congress, the courts, and the media. Essays by leading experts will inform and engage both new students and seasoned scholars who are seeking to gain a broader understanding about presidential power and leadership. 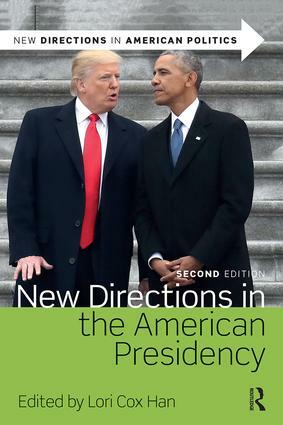 New Directions in the American Presidency features clear, concise analyses of how the presidency currently functions and fruitful suggestions for new research directions in the field. With important contributions by leading experts, this book will have a comfortable home in classrooms and be kept close at hand by junior and senior scholars alike.